This past Tuesday, July 10th, was Dr. Rudy Crew's debut with the Oregon Education Investment Board. The OEIB was not only discussing the current state of their process, but also reviewing how to go forward. Education expert Linda Darling-Hammond was invited by Dr. Crew to consult with the OEIB board and assess what to think about with regards to building a quality public education system. A future post will be coming to share thoughts and ideas she presented at this meeting. Oregon Save Our Schools was invited to share a 10 minute testimony with the OEIB. Tom Olson, Joanne Yatvin, Betsy Salter and Steve Buel gave an overview of the OEIB proceedings over the last year and shared concerns with the OEIB and newly appointed Dr. Crews that the process was moving too fast, was not including or involving the voices of the public, and was too focused on corporate education reform goals such as the continued emphasis on high-stakes testing. Other community members spoke up and offered feedback as well. Parent and teacher Tricia Snyder asked for the OEIB to slow down and review models such as that of Finland to provide each Oregon student with a "well-rounded, well-funded, (and) solid" education like she had growing up in Coos Bay, Oregon. She expressed concern over the fact that Oregon, typically a visionary and progressive state was "selling out" its public education to that of a corporate reform model that ignores the voices of teachers, parents, and students. Here is a link to her full video testimony (5 min). Oregon SOS member, Gary Hargett, sent in testimony to the OEIB with concerns over the use of high-stakes testing. Another new member of Oregon SOS, Lisa Shultz, who is also a former Beaverton school board member and works as an electrical engineer, shared her concerns with the Return on Investment (ROI) Dashboard program that was presented at the meeting. This program tries to show where the state can get the most bang for their buck for their investments in education. She felt that it was too complex of a goal to use such a program. In fact she said what they were trying to do was harder that what engineers try to do already in their work. She hoped they would reflect on that before depending on it for all the answers. 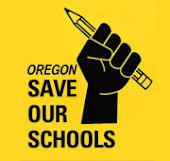 Hopefully, after all the testimony received from the public and Linda Darling-Hammond on Tuesday, the OEIB, Dr. Rudy Crew, and Governor John Kitzhaber will work to reassess their goals in developing a high quality public education system here in Oregon. Only time will tell, and Oregon SOS plans to keep up the hard work of getting Oregon headed back in the right direction for all of Oregon's students. The State Board of Education recently adopted a rule on teacher and administrator evaluation that can open the door to the use of standardized test scores as part of that evaluation. Such test scores would also play a role in other proposals, such as “common standardized formative assessments” and a longitudinal data base of individual student information. The “continuum” is a psychometric, mathematical model, with tests constructed separately for the supposed continuum of each subject matter. It is not a model of learning or knowledge. Tests that do have diagnostic potential would be even more time-consuming than the tests schools are currently saddled with. Such tests would not tell a teacher anything the teacher cannot already know through the daily act of teaching. Test scores also do not tell a principal anything about a teacher that the principal cannot see through observation. Moreover, standardized tests contain a degree of inaccuracy, called “error,” particularly at the student or classroom level. They are not sensitive to short-term growth. Again, tests that might be sensitive would consume even more time and resources. The membership of the Oregon Education Investment Board is not selected on the basis of its knowledge of teaching and learning, much less the theory and construction of standardized tests. Therefore, as the OEIB considers proposals that have implications for more testing and use of test scores, I encourage the Board to seek the counsel of people who do understand the theory and limitations of standardized tests, in particular, people who do not have a personal or business interest in the decisions to be made. That would exclude test marketers and developers and those who sell the technology that testing requires. People who have that expertise can be found within Oregon public education and outside of the businesses that stand to profit from more testing. I am a self-employed consultant, specializing in the evaluation of programs for English learners and migrant students. I have formal training in test theory and development. I participated in the early stages of Oregon’s standard setting on the state assessments. I was a member of the original team that developed Oregon’s English Language Proficiency Assessment. We appreciate the opportunity to present this testimony on behalf of Oregon Save Our Schools. We are a rapidly growing grass roots organization that advocates for better public education for our children and youth. We are all unpaid volunteers—parents and grandparents, educators and people from the private sector. We accept money from no one for our advocacy work. You may wonder why Oregon Save Our Schools has been such a regular observer of your work. Let me be candid with our reasons. We have deep concerns with both the substance and the process of developing state education policies over the past two years. The Substance of Proposals for Education Reform. Policy dialogue at the state level has leapfrogged over any deep discussion about the broad purposes of public education in our society. You have ceded control of this dialogue to those whose sole concern is workforce development. Where is the discussion about developing our students as individuals with a zest for life? Good family members? Good neighbors? Good and thoughtful citizens? You have been rushed to adopt recommendations through a flawed process that rests on flawed assumptions about effective drivers for reform (1). The recommendations you have been presented for so-called “proficiency based learning” and “outcomes based funding”(2) have not been subjected to any careful analysis or scrutiny regarding their feasibility and necessary statewide capacity building costs to scale them up. In spite of the continuing decline in the level of state support, coupled with escalating levels of poverty in our schools, you have apparently assumed that we can simply turn reform over to technocrats who promise to create a top-down standardized, testing and technology-driven education system. Of course, that system will also ensure huge profits for private education vendors. But it will not result in more innovative workers—let alone good family members, neighbors and citizens. Oregon’s proposal to the U.S. Department of Education seeks a waiver from a few No Child Left Behind requirements. Oregon promises to satisfy the federal government’s demands by increasing the stakes on standardized tests, allowing for interventions that create opportunities to for-profit education companies, and encourages school closures and governance changes. Nowhere have we heard a due diligence cost-benefit analysis of these kinds of promises Our own State Department of Education says implementing the waiver request will have a $116 million price tag over the next two years (almost all of that cost imposed on local districts’ strained budgets). (4) That estimate does not include the millions we continue to spend to erode instructional time for unproductive testing and test preparation! Nor does it adequately calculate the dangers to human privacy provoked by the desire for ever-more sharing of individual data such as in the Alder project. How has Oregon education policy come to this? The process for developing recommendations has simply been centralized and non-transparent, and has not seriously engaged the public. Senate Bill 909 authorized unprecedented centralized state control over public education. The Governor appointed an Education Investment Team. He employed an Education Policy Advisor and Deputy Advisor. The Oregon Business Association loaned a lobbyist to this effort. You were appointed to oversee this centralization. The Governor employed an Investment Board Manager and several additional staff members. He and you have now employed a Chief Education Officer to oversee of all levels of education. Apparently, a Deputy Superintendent will also soon be employed to oversee K-12 education. The Oregon Commission on Children and Family Services has now been wiped out. The local commissions will be wiped out over the next year---all to be replaced by your more centralized Early Learning Council. Our conservative estimate is well over $1 million has now already been spent in staffing and consultant costs to run this unprecedented centralization effort. In the face of this centralization, we have also witnessed a lack of transparency in the development of policy proposals. This began with the Education Investment Team’s work last year. In its final meeting in August, theTeam heard a set of findings and recommendations from a private group called “LearnWorks.”. That group had been funded by the Oregon Business Council with grants from a variety of foundations, including special interest private corporate foundations. The Governor’s Investment Team never took a vote on anything, including the LearnWorks recommendations. And they never provided the opportunity for public testimony at any of their meetings. We testified at your first Board meeting last November. Since the only recommendations you had at that point were from the privately-sponsored LearnWorks effort, we encouraged you to conduct a year-long vigorous statewide public dialogue about the future of Oregon public education. The answer to that request was a few quickly-called public forums that were held in January 2012. There’s no evidence that these forums had any significant impact on your subsequent education policy actions. You missed a powerful opportunity to ask local parents, educators and their elected school boards to join in a conversation about their schools’ aspirations, needs and challenges. Instead you rushed forward. As you enter your next several months of deliberations, Outcomes Based Budgeting will become your pre-occupation. The recommendations you receive will be developed under still ANOTHER secret process, the work of an “Education Funding Team.” The Salem Statesman-Journal reported in its June 9 editorial that these meetings will not be open to the public. We agree with the paper. They should be open to the public. What is there to hide? The new process of so-called “outcomes based budgeting” has never been successfully implemented by any state. Oregon’s 560,000 school children and youth cannot afford another year waiting in intolerable class sizes while technocrats continue their quest for more elegant “models” and “projections of trajectories.” In the interest of our children’s future, here is what we ask of you. Convince the legislature to take steps in this next session to begin securing adequate and equitable funding for a quality public education. Ask them to eliminate, over time, the QEM’s defined current $3 billion funding gap. To those who say it can’t be done, ask them to consider the newest national study of school funding by the Rutgers University Education Law Center. (8) Oregon received a grade of “F”. based on an analysis of the relationship between our state’s economic productivity and our low level of funding for education.. Declare a moratorium on using test scores to make any high stakes decisions such as school or teacher evaluation, school or district labeling or funding. Take steps to minimize the negative aspects of testing which narrows the curriculum and promotes teaching to the test. Take concrete action to increase state support to expand “wrap around” health and social service programs designed to help children and their families remove poverty’s barriers to learning. Abandon your top-down Achievement Compact strategy. Make a clear policy commitment to local control and seek the citizens’ “voice.” School problems are best solved by local citizens. Smart “tight/loose” state education policies will only emerge from unprecedented engagement of our citizens---not from technocrats building more untried models in the back room. federal efforts to make schools uniform such as the Common Core. (1) Michael Fullan, Choosing the Wrong Drivers for Whole System Reform. Centre for Strategic Education: Seminar Series Paper #205, April 2011. (2) LearnWorks: Findings and Recommendations, August 2011; Oregon Learns: The Strategy to Get to 40/40/20. August 2011. (3) Fullan. Ibid; M. Mourshed, .C. Chinezi, and M. Barber How the World’s Most Improved School Systems Keep Getting Better, McKinsey and Company. London (2010). (8) Bruce Baker, David Sciarra, Danielle Farrie, Is School Funding Fair? Second Edition, 2012. Rutgers University Education Law Center, Newark, NJ (June 2012). INVESTING IN OREGON’S PUBLIC EDUCATION? Oregon has lost almost 16% of our teachers, teaching assistants, and school maintenance and clerical workers over the past three years. In aggregate, our school districts cut 287 school days in the current school year. (Try helping struggling kids with 15 fewer learning days!). The aggregate over the past three years amounts to 951 lost days for learning! Oregon’s per student spending has declined from 15th in the nation in 1997-98 to 37rd in 2008-2009. Oregon’s education funding received a grade of “F” in a new national study that examined Oregon’s GDP value and the relatively low level of effort for funding public education. Since 2003, Public Education has received less than one-third of the percentage increase that went to public safety. . We spend more on prisons than education. According to the legislature’s own Quality Education Commission research, the state is currently $3 billion short of what it takes to provide K-12 quality education. The last five years saw a 5% reduction in spending on K-12 schools. Yet, the state’s totaltax breaks grew by 12%. These breaks amount to over $26 billion, while funding for K-12 schools has shrunk to current level of $5.6 billion. The number of Oregon children living in poverty continues to escalate, and these children have special health and learning needs. The state’s response? Ignore this reality and push harder on our educators as the sole “solution.” This is a travesty that prevents improved achievement across the state. Data Sources: State of Oregon Tax Expenditure Reports; Oregon Legislative Fiscal Office; Our Oregon; Oregon Education Association Survey of Cut Days; COSA/OASBO School Budget Surveys, Sept. 2009, 2010 and 2011; Education Law Center Rutgers University..